Echo Brickell in the heart of the Financial District, is hosting an exclusive art gallery event at their sales office inside the Four Seasons Hotel in Brickell. Collaborating and co organizing the event are Brigitte Respaut Clement from OfCourseMiami, top Realtor in Miami and Elodie Couturier from Appraise Art who represents the prominent French artists. 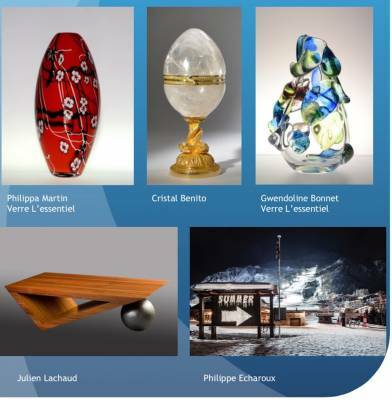 Together the two are hosting an exhibition of works of art by prestigious French artists including Cristal Benito, Philippe Echaroux, Gwendoline Bonnet & Phillippa Martin from Verre L’ Essentiel and Julien Lachaud. This private event will bring together an elite clientele who have a passion for both art and real estate. One of the artists displaying his works of art is Cristal Benito who can be described as an exception crystal master being able to cut crystal to form unique pieces of art. He has developed many creations through various shapes and dimensions. Fusing together the reflection of light through glass allows his pieces of art to be enhanced for a unique look. In addition, Philippe Echaroux, a French street artist born in 1983, will also be displaying his innovative collection. He invented and coined the concept of Street Art 2.0 with his “Painting with Lights” concept that has been featured in over 44 countries. He has photographed for high end brands such as Adidas, Lego and Fiat. Phillippa Martin and Gwendoline Bonnet will showcase their passion of glass blown pieces and will be featuring their majestic chandeliers. Furthermore, Julien Lachaud, a creative cabinetmaker, will also displaying his art at the event. His particular style is characterized by geometrical and innovative modern lines. The exhibition of various forms of art works will be held in the Four Seasons Echo Brickell Sales Office on the 15th floor from Feb 25th- March 5th, 10am -6pm, with a private cocktail preview Feb 24th 7pm-9pm . Echo Brickell is hosting this exhibition in conjunction with the Appraise Art in order bring to light the works of French artists. Developed by Property Markets Group, Echo Brickell is a 180 unit residential development conceptually designed by Carlos Ott. Featuring a variety of one, two- and three bedroom residences, Echo Brickell is a boutique development with only 180 exclusive residences. The development in the heart of Brickell will further distinguish itself by offering larger floor plans than those that are typically found in the Brickell and Downtown condominium markets. Property Markets Group is currently developing over fifteen projects between Manhattan, Miami and Chicago. Some notable developments include 210 West 18th Street, a $600,000,000 luxury condominium project in Manhattan; 435 West 50th Street, a $200 million multi-family residential project in Manhattan; 10 Sullivan; 111 Leroy; 627 Greenwich; $1.6 billion project at 111west 57th Street, which is slated to be among the tallest residential buildings in Manhattan. Current PMG developments in South Florida include “95th On The Ocean” one block from Bal Harbor Shops; "Sage Beach” - a 24 unit boutique development on the sand in Hollywood beach; And the sister project to Echo Brickell, “Echo Aventura” – a 190 luxury condominium located on the last water front property in Aventura. Mei Miami Beach is a PMG signature development, delivered in 2008 and is regarded as the premier development on Millionaires' Row in Miami Beach. Echo Brickell another development by Property Markets Group is 180 residences located in the heart of the financial district. The development will mirror PMG's 25 year history of delivering boutique luxury condominium product. In addition, PMG’s most recent project is Muse located in Sunny Isles which consists of 68 oceanfront residences (http://museresidences.com). The exclusive sales and marketing team for all Florida projects is ISG World. An exceptional event organized by Appraise Art LLC & OfCourseMiami, bringing high-end VIP people celebrating luxury condominiums’ sale, discovering one or several artists during a special cocktail-party & exhibition. Elodie Couturier is graduated in History of Art & Archeology from the french university La Sorbonne, Paris, France and in Jewel & Gemmology from the “Institut national de Gemmologie”, in Paris France. She is the dedicated specialist whithin those fields of expertise. Elodie Couturier organizes for contemporary artists special events enhancing and promoting the artists' work. In 2010 , 2011, 2012 -2013 Brigitte Respaut-Clément closed more than $ 40 Million of cash sales with foreign buyers only. She is on top of her game and poised for further success.She has never experienced a growth in any business as meteoric as the one she is experiencing now. She is proud of the accomplishments that she has attained in less than 3 years. Banksy’s “Kissing Coppers” auctioned for $575,000 with FAAM!